What is the AC Electronics' 90-30 Extreme Temperature Rated Ballast Difference? 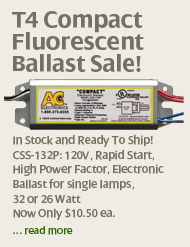 AC Electronics, a leader in the Ballast Industry since 1996, was the first ballast manufacturer to introduce super- robust fluorescent and HID electronic ballasts designed from the start to operate in extreme temperature conditions. The performance of competitive ballasts often don't measure in "real world" use. This includes very hot and very cold applications. Most competitive fluorescent and HID ballasts are only capable of operating in "mild" environments. 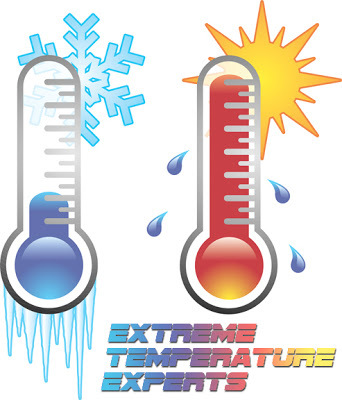 Competitive case temperatures are often rated for operation only up to 75° Celsius (+167°F) and down to -10° Celsius (+14°F). This tight range is very often exceeded in "real world" conditions", resulting in premature ballast failure or the failure to start the lamp. In 2000 AC Electronics developed its first super-robust 90-30 Extreme-Temperature Rated ballast. Designed for case operating temperatures from +90°C (+194°F) -30°C (-22°F), it specifically address the major cause of premature ballast failure, common environmental temperature extremes. Most competitive ballast failures are caused by overheating. Small, tight fluorescent and HID fixtures combined with poor air circulation can cause extreme heat, often coming close to temperatures that can boil water. A +75°C rated ballast can't begin to handle these temperatures. Very surprisingly, some competitive ballasts even begin to suffer damage to their electrolytic capacitors when they begin to approach their +75°C maximum rated case operating temperature. Putting this in automotive terms, many competitive ballasts begin to degrade well before they reach their "redline" maximum rated operating temperature of +75°C. By comparison, AC Electronics' 90-30 Extreme Temperature Rated Ballasts are designed to work perfectly AT its +90°C "redline". AC Electronics' 90-30 Extreme Temperature Rated Ballast is your answer to the common high temperatures found in many fixtures. Most competitive ballasts are not robust enough to perform in the cold outdoors. While a less common cause of failure, ballasts sometimes have to perform in cold outdoor climates, such as parking garages and unheated industrial areas. A competitive ballast only rated for a minimum case operating temperature of -10° Celsius (+14°F) simply can't handle seasonal freezing temperatures and won't start the fluorescent or HID lamps. As a major benefit of the robust extreme temperature design, AC 90-30 ballasts give a huge extra margin of protection in less challenging environments. This provides extra performance insurance in ALL applications. Heat Protection Since most premature ballast failures are caused by heat, first we control the HEAT! Our entire design and engineering process focuses from the beginning to making AC Ballasts ballast operate cooler and longer than the competition. The key sensitive components, such as the MOSFETs, have higher temperature ratings than competitors to handle the heat. We insulate key heat sensitive components to keep heat away. Integral mini metal "radiators" move heat directly away from key components. Cold Starting: We use the maximum ANSI requirement level of pre-heat current and Open Circuit Voltage. Each ballast is designed to the specific lamp characteristics. AC Electronics' 90-30 Extreme Temperature Rated Ballast gives extra protection in ALL your applications. Their super-robust construction performs flawlessly in the most demanding applications. In more "moderate" applications they give an even greater added margin of protection. The result is a ballast you can trust to deliver maximum long term performance! 90-30 Extreme Rated ballast = longer life and increased durability in all applications.